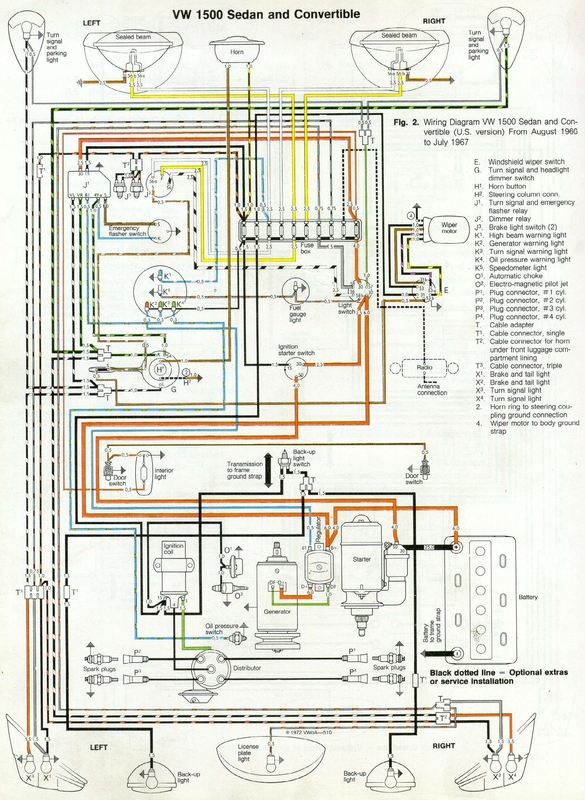 I’ve received 4 emails in the last 2 weeks asking for the correct wiring diagram for both a ’66 and ’67 Beetle. Illustrated below is the VW 1500 sedan and convertible (U.S. version) from August 1966 to July 1967. Available for free download. I am working on a 67 beatle and it has no spark. Somebody may have wired this wrong and I do not know where the resister wire is. Could it be in the coil? It could be so many things. I’ve sent your comment to one of our writers. We will get you more feedback soon. oh my gosh this is amazing!! I just got a 67 from my grandfather recently and I’m still working on some stuff and this is exactly what i needed. thank you so much!!! Thanks! Take a look around, this site is all about the ’67 Beetle! We are here for you. Yes Sir! I’ve only begun to search this site and already I’ve found allot of use full information. thank you. Email anytime if I can help! Hello. I have a fully charged battery. All the outside lights are working..signals/highs/stoplights/hazards. Was losing battery voltage while car was on. As soon as I disconnect the neg. On battery voltage starts going up fast. Also after a while of being on if I turn it off it won’t start again. Lights dim and starter wont make any sounds. But battery reads over 12.5v. Whats going on ..?? Have you checked the voltage regulator.